We have noted with regret that the bankrupt PF regime wants to continue with their misguided policy of taxing citizens for sinking boreholes. It is cruel to tax people who are finding alternative ways of accessing clean water for drinking arising from failure by government to meet its civic obligations of which one of them is providing water, for water is life and a human right. As a matter of fact, we are of the view that such community initiatives by citizens are supposed to be rewarded by tax rebates than punitive measures of taxing them. Furthermore, how can the PF be implementing such measures with the current drought in some parts of the country amidst unpredictable global weather conditions due to the effects of climate change? The fact is that the PF has no capacity to provide citizens with clean water for our citizens and that’s why many communities are currently sharing dirty and unhealthy water with animals, but when they take it upon themselves to access clean water sources by digging boleholes, they are punished. This is retrogressive and kills community initiatives that are critical in complimenting government efforts in areas they fail to serve citizens. Citizens with a bit of resources in these areas should be encouraged to sink more communal boreholes and other water points as opposed to discouraging them and punishing them by burdening them with more taxes. We understand the need to avoid underground water contamination, especially in urban areas, but even then, the role of any serious government would have been to merely offer technical support on where water points can be sunk as opposed to prohibitive measures such as taxing people who are spending colossal amounts of money seeking for a life saving commodity like water. We know that this is just another scheme by the corrupt PF regime to abuse citizens by siphoning hard earned money from them and put in their individual pockets to enrich themselves further. When the UPND democratically takes over power in 2021, we shall immediately undertake an audit to ascertain which taxes are burdensome and excessive to our citizens. Bolehole and rental taxes will be among those that we shall immediately eliminate. Water is life and a human right. Ba HH,if you have nothing to say, it’s better to keep quiet. I see nothing wrong with the borehole fee, which is a once-off thing anyway. I paid K250 for my borehole and I have even forgotten about it. Stop being petty, otherwise you will never rule Zambia. 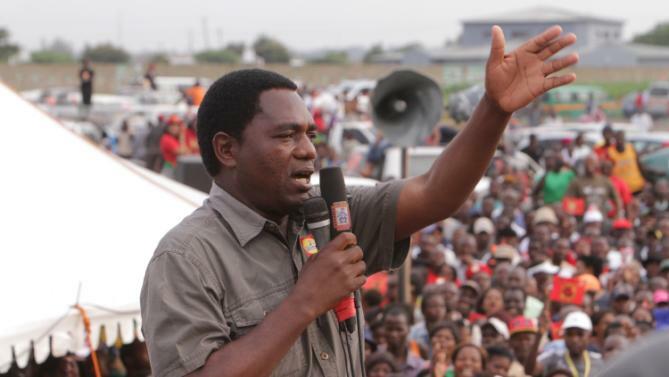 HH should indeed have been elected many years ago. But he has lost the elections FIVE times. I’m afraid the ordinary Zambians don’t believe in losers. Especially when they congregate with that bandit GBM! Dear HH, get rid of that man and maybe, just maybe, you have a stinking chance of getting into statehouse! Which you vut especially the country roundly deserves! be it tribalism or not HH is winning 2021 elections. enough is enough for pfoolse . no amount of foolishness will stop HH from winning this time. On this one you are totally very wrong. Am very disappointed. As others have pointed out already. Laws should not apply in retrospect. It is wrong and immoral for PF to charge for boreholes that were drilled some years back. Very true observation from a man who should have presdent of this country. Its just unfortunate that most zambians dont see beyond their immediate needs or beyond the K50 notes handed to them during campaigning and voting times. This man HH has bright ideas for zambia and will drive this country forward. If only zambians can overcome this disgustng tribalism and bring in a government of men capable of growing the economy. How do you have a government of dunderheads like Lusambo, Sikazwe and of course the president homself? Show us where his ideas have worked for the majority Zambians apart from providing employment as herdsmen to his tribesmen.